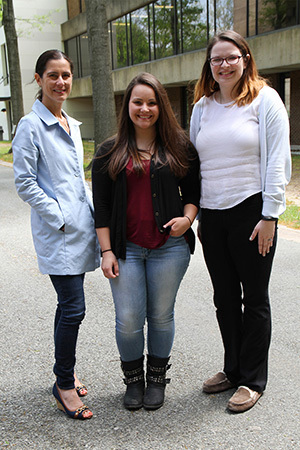 From left, Professor of Education Theresa Capra with Noyce scholars Savannah Dziepak and Meghan Knamm. West Windsor, N.J. -- For community college students who enjoy math and science, and are interested in teaching, the Mercer-William Paterson University Robert Noyce Scholarship Program is a perfect fit. That’s the case for two Mercer County Community College (MCCC) graduates, Biology student Savannah Dziepak and Education student Meghan Knamm, who will receive their diplomas on May 18, and then transfer to William Paterson University to earn their bachelor’s degrees and certification to teach K-12 science. Both will head to WPU with major Noyce scholarships. Dziepak started at Mercer in 2013 at the age of 16 after earning her High School Equivalency online. She first considered concentrating in Exercise Science, but then she took an Anatomy class. “I fell in love with biology. I am also interested in environmental studies,” she said. Dziepak started tutoring regularly in the MCCC Science Learning Center. “I realized I loved teaching something I was interested in.” An American Honors student, Dziepak says the Honors program helped her improve her writing skills and narrow down her career path based on her strengths. “Teaching was it for me,” she notes. Knamm has also spent time as a tutor, assisting fellow students in statistics in MCCC’s general Learning Center, a job she will continue this summer. She also teaches youngsters at her church. Her goal is to teach at the middle school level. “That’s when a real focus on science starts. It’s important to tie it in to everyday life and make it relevant for students,” she said. Dziepak is planning to teach high school biology. “At the high school level, you get students who are truly interested. If I teach it right, they will be able to see the biology in everyday life.” She plans to continue for her master’s degree and, ultimately, her doctorate degree. Reflecting on their Mercer years, Dziepak and Knamm say they are glad they made the most of the opportunities available to them. “Do something, join something” is their advice to other students. Noyce scholars receive $10,000 per year for up to three years to cover tuition costs at WPU. They must maintain a minimum 3.0 GPA and teach for two years in a high needs district after earning their bachelor’s degree. The program is sponsored by the National Science Foundation, Division of Undergraduate Education.